Posted on Thu, Feb 16, 2012 : 5:03 a.m. 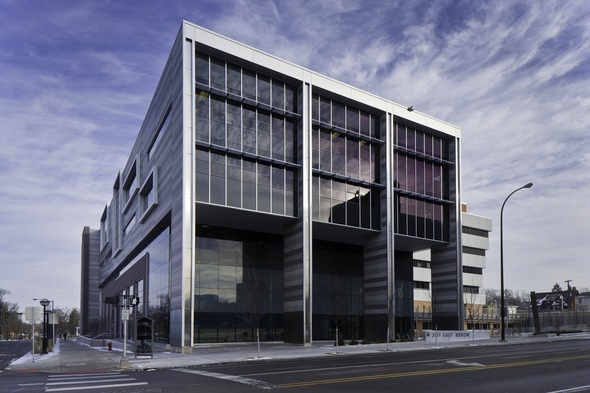 The Michigan Chapter of Associated General Contractors awarded Clark Construction a 2011 Build Michigan Award for construction of the Ann Arbor Municipal Center. The award was presented during an awards program on Friday, Jan. 27 at the Inn at St. Johns in Plymouth. The Ann Arbor Municipal Center project was constructed to house the City of Ann Arbor’s courts, police, IT, facility, management and other city departments. The building is LEED Gold certified and includes white reflective TPO roofing, solar collectors for hot water, a green roof and 100 percent storm water retention. The project consisted of a five-story, 112,000-square-foot addition immediately adjacent to the Guy Larcom City Hall building. The new addition houses the IT department on the first floor along with a garage for the police department and K-9 housing. The second and third floors house the Ann Arbor Police City Police, and the fourth and fifth floors house the new court rooms and Judges’ Chambers. The Judge’s Chambers are also connected to the parking garage via a secure elevator. In all, five elevators provide vertical travel throughout the building. Clark Construction Co. was founded in 1946 and is headquartered in Lansing.